Meal planning for seniors is often difficult due to nutritional needs, food intolerances, and health conditions. 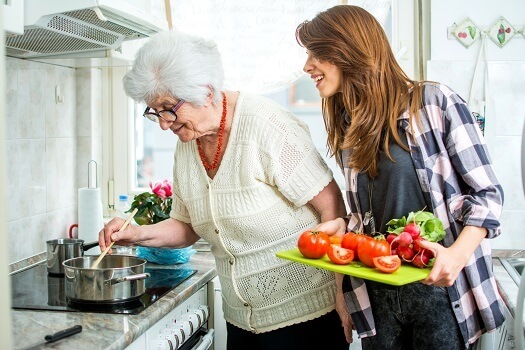 However, preparing meals ahead of time can save caregivers time and minimize stress while also making it easier for seniors to feed themselves. Instead of having to cook a homemade meal, older adults can simply reheat a pre-prepared dish. Here are six healthy meals to make ahead of time for your senior parent. Soups and stews are a great option for caregivers looking for healthy meal options. They’re easy to store in the freezer and can be customized to your loved one’s preferences and dietary needs. Try chicken noodle soups made with lean chicken, whole-wheat noodles, and hearty vegetables. You can also try healthy chili recipes made with ground turkey and protein-filled beans. Soups and stews are good for seniors who have difficulty chewing and swallowing food. Many older adults need help preparing healthy meals. If your aging loved one needs occasional help with bathing, grooming, cooking, or other basic household tasks, or if you need time to attend to important personal matters, reach out to Home Care Assistance, a leading provider of live-in and respite care. Toronto seniors can maintain their independence while living at home with the help of our reliable respite caregivers. Eating steel-cut oats is a healthy way to start the day, as their fiber content promotes healthy digestion. Whip up quart-sized batches of oats, which can be safely stored in the refrigerator for days. When your loved one wants breakfast or a snack, he or she can spoon out a portion of oats, microwave it, and add a pinch of sugar to taste. To increase the nutritional value, consider adding protein powder or calcium-rich milk. For seniors who are meal-resistant, it’s important to make eating as easy as possible. When caregivers prepare pre-proportioned snacks, seniors may be more willing to eat. Options include hard-boiled eggs, which are a great source of protein, and snack-sized portions of cheese and whole-wheat crackers. Make healthy scrambled eggs filled with low-fat cheese, lean proteins, and leafy vegetables, then pour the mixture into muffin tins and cook. Store them in the freezer in plastic containers, and your loved one can pop them in the microwave when he or she wants a warm breakfast. Preparing healthy meals for a parent can be challenging, especially when you have other important tasks to tend to. If you’re the primary family caregiver for an elderly loved one and need additional assistance providing high-quality senior care, Toronto Home Care Assistance can help. We are a leading home care agency committed to changing the way seniors age. Baked pasta casseroles keep well when frozen, and they’re versatile enough to accommodate a senior’s dietary needs and preferences. Boost nutritional value by using whole-wheat pasta and adding vegetables such as mushrooms, zucchini, and spinach. You can store the entire casserole in one large container, or you can portion out single servings and place them in individual containers. The latter option may make it easier for your loved one to choose and reheat dinner when he or she is alone. For seniors who have difficulty using utensils, make some freezer meals that can be eaten via hand. Chicken fingers are a popular option. Use fiber-filled corn flakes and parmesan cheese as a crunchy coating, then freeze the nuggets for later use. Eating nutritious meals is not the only way older adults can boost their health. Seniors who want to remain healthy as they age can benefit in a variety of ways when they receive professional home care. Toronto, Ontario, Home Care Assistance is here to help your loved one accomplish daily tasks, prevent illness, and focus on living a healthier and more fulfilling life. To learn about our high-quality in-home care plans, give us a call at (416) 488-8777 today.